This month’s featured Offices Macclesfield Tenant is The Weave. The Weave is located at the back of the Adelphi Mill Offices Macclesfield, alongside the Macclesfield Canal. The Weave is a family business run by Tim and Lucy (pictured right). 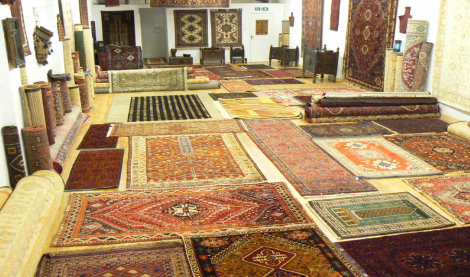 Their company imports & retails quality Oriental Carpets, Persian Rugs and Tribal Interiors. We interviewed Lucy to find out more about her experiences of running her own business and The Weave’s product and services. 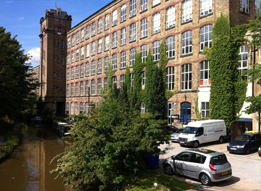 Adelphi Mill Offices Macclesfield – How did you first get in to the Carpets and Rugs business? We first had the idea that we would love to have an Oriental Rug shop after spending 3 days choosing and haggling over a rug in a shop in Udaipur, India. The idea of working in such a fascinating and creative business for which we both shared a great passion was very tempting and motivational. Adelphi Mill Offices Macclesfield – Is your retail showroom / office space in the Adelphi Mill your business’s first premises? The Weave opened it doors in January 2005. Our first shop was located in Bollington Cross and although the shop was a lovely space we always knew that a larger premises was needed, ideally a location with convenient parking for customers. So, in October 2009, we took the plunge and moved our shop to the much more spacious and picturesque location at The Adelphi Mill. Adelphi Mill Offices Macclesfield – What would you say are the pros and cons of running your own business? We do enjoy working for ourselves and the freedom it gives us to take our business in the direction we choose. We mostly love the purchasing of new stock; for us to be able to continue to search for interesting and unusual rugs to buy, even after our own house had no more capacity for rugs, was a major influence behind opening our shop in the first place. The downside to running our own shop is the time given over to keeping the shop open 6 days a week. We would like to have more time to plan and execute additional trips to Iran and India and such places in order to find a greater variety of rugs closer to source. Adelphi Mill Offices Macclesfield – What was the first rug you ever bought? We bought our first rug together in Udaipur, India. It was a Kashmiri wool rug and we still love it. Adelphi Mill Offices Macclesfield – Is it true that hand made rugs, like private number plates and fine art, not only hold their value but can also increase in value with time? It is indeed true that hand made Oriental rugs do hold their value well due to their artistic and durable qualities. Some rugs will actually become more valuable with time but not all rugs are of good enough quality to be realiable as an investment. That being said, as the costs to weave rugs are increasing all the time, so too will the value of good rugs as the cost to replace them will have increased. Adelphi Mill Offices Macclesfield – How many man days do the more elaborate rugs take to make? A skilled weaver can do about 6,000 knots per day. The time it takes to weave a rug varies, mainly being dictated by the quality of the weave i.e. the knots per square inch. It is usual for more than one person at a time to work on a rug of this size. Therefore, the time will be divided by the number of weavers who have worked on the rug, although the man hours remain the same. These time frames though do not include the shepherding, clipping, spinning and dyeing of the wool, nor the designing, clipping, washing and drying of the carpet. The more elaborate the use of colour in the rug the greater the time it will take to make it. This is due to the pattern being more complicated to follow and the time-consuming process of changing wool more frequently. 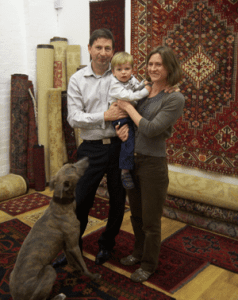 Adelphi Mill Offices Macclesfield – How long will a handmade rug last? A handmade rug should last a lifetime of use. The Pazyryk rug is an extreme example of the longevity of rugs; it is the oldest known rug and it dates back to 500 BC. Most rugs will last between 50 – 200 years with many lasting for several centuries. Adelphi Mill Offices Macclesfield – Any other comments? The Weave has been able to expand the products it sells now that we have a larger space. We now have an amazing range of hand carved wooden furniture and crafts from Pakistan, India and Ethiopia. We feel these tribal pieces compliment our rugs wonderfully and we can offer beautiful and original storage chests and cabinets to our customers, as well as small pieces, such as hand crafted bowls and mirrors, which make lovely gifts. The Weave are Importers and retailers of Oriental & Persian Carpets, Crafted Furniture & Gift Items from the Hindu Kush, Himalayas, Ethiopia & Punjabi regions. Situated alongside what’s often described as one of the prettiest parts of the Cheshire Ring Canal route, The Weave Oriental Carpet & Tribal Interiors showroom has finally found the long awaited but perfect setting to display its many thousands of beautiful Oriental Carpets and Tribal interior furniture items. With the new showroom now open, The Weave offers all the space customers need to leisurely enjoy the greatest selection of quality Oriental carpets in the UK. As explained by the proprietors, the production of truly authentic Oriental carpets varies greatly according to lifestyle, skill and the availability of materials to the weaver. Ultimately, the design of the carpet is a reflection of the weaver’s personality and as such we should never see two identical pieces. It’s this important factor which explains why we see such a great variation in the styles, sizes and qualities of carpet available. Price too is largely dictated by this and explains why we see 5x3ft tribal rugs from around £70 to thousands for the bigger and more beautiful pieces. It’s this very diversity of the weaver’s ideas that allows Oriental carpets to look fantastic in all types of settings, modern or traditional. It’s all about finding that perfect piece to suit the right home. Whether you’re looking for that spectacular, one-of-a-kind showpiece or a smaller rug to add a touch of cosy character to your home you’re likely to find that perfect piece at The Weave. Adelphi Mill Office Macclesfield is based in Bollington, Macclesfield and provides high-quality office space to let, industrial units to rent, workshops to rent and storage space. 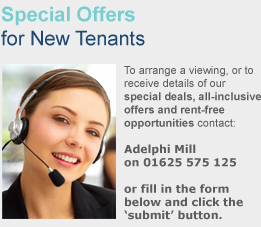 Adelphi Mill Offices to rent also offers serviced offices in Macclesfield. The Adelphi Mill is a Grade II listed former cotton mill which has recently undergone a multimillion pound refurbishment to provide modern and spacious office space. If you’re looking for office space to rent in Macclesfield contact the Adelphi Mill Offices Macclesfield today on 01625 575 125 to arrange a viewing. Would you like adelphimill.co.uk to feature a case study of your business?